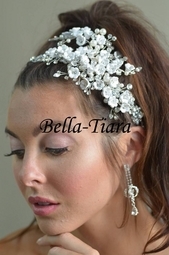 Description: Gorgeous Royal collection exquisite romantic wedding hair comb. Stunning combination of crystal pearls and off white tiny flower with a large bold statement makes this the perfect wedding comb for that glamorous bride. approx 6" long x 3 wide. **We do fast shipping, so please contact us!